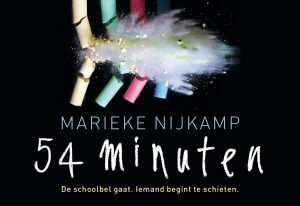 Nijkamp masterfully brings to life the terror and disbelief that a school shooting elicits and makes the reader go through that same turmoil. A thought-provoking must-read! – a Winter 2015–2016 Kids’ Indie Next Great Reads pick. This brutal, emotionally charged novel will grip readers and leave them brokenhearted. Love, loyalty, bravery, and loss meld into a chaotic, heart-wrenching mélange of issues that unite some and divide others. A highly diverse cast of characters, paired with vivid imagery and close attention to detail, set the stage for an engrossing, unrelenting tale. 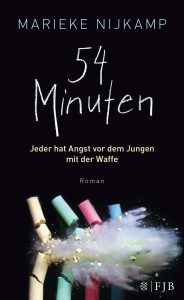 The starkly chilling realism and themes of abuse, death, and assault, among others, may prove too much for younger or sensitive readers, but the story unquestionably leaves an indelible mark. Harrowing first-person narrations reveal the way characters try to understand what is happening, where they are in relation to the emergency, and what they can do to save those they love… readable, gripping, and well balanced. Strong characterizations capture diversity in gender, race, ability, and sexuality. Even reluctant readers will anxiously pursue the ending, unable to turn away from the tragedy and in desperate hope for a resolution, knowing there cannot be a happy ending. The core message and potential to open thoughtful discussion make this a solid choice for teen readers. With narration firmly rooted in the moment and smooth transitions in and out of flashbacks, each first-person account reveals an intricate web of betrayal and pain that connects the four to Tyler and the horror he has unleashed. Less than an hour can reshape your life. In one school, one person, with one gun, changes everything. A brother, a boyfriend, a classmate. A wish of revenge. Unfolding through the eyes of those close to him, a story of tragedy and loss; yet, through it all, hope. 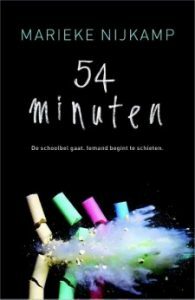 Nijkamp’s brutal, powerful fictional account of a school shooting is important in its timeliness. 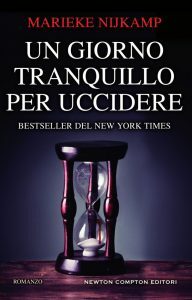 (…) Maybe it’s this kind of book that can push people to think on a more human level about the horror of these events and how we can prevent them in the future. [F]ifty-four intense minutes of bravery, love, and loss. [THIS IS WHERE IT ENDS] leaves you in awe. Stunning, diverse, and unforgettable, THIS IS WHERE IT ENDS is a book everyone should read to better understand each other and the world around us. 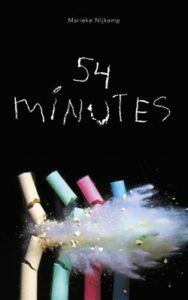 As long as there are Newtowns and Columbines there will be a desperate need for gripping, well-written, and poignant novels like this one. We are the most gun-violent country in the world, and yet little has been done to stop these rampage killings. Hopefully THIS IS WHERE IT ENDS will make the problem more real to a generation that still has the time, energy, and willpower to do something about it. THIS IS WHERE IT ENDS is simultaneously heart pounding and heart wrenching. Every word hits frighteningly close to home and is tragically too familiar. This book will leave you asking questions that we as a society should have answered a long time ago. ☙ THIS IS WHERE IT ENDS is a #1 New York Times Bestseller. ☙ THIS IS WHERE IT ENDS is a National Indie Bestseller. ☙ THIS IS WHERE IT ENDS is a Publishers Weekly Bestseller. ☙ THIS IS WHERE IT ENDS is a 2017 Barnes & Noble Bestseller. ☙ THIS IS WHERE IT ENDS is a Publishers Lunch Buzz Book (Fall/Winter 2015 edition). ☙ THIS IS WHERE IT ENDS is a Winter 2015–2016 Kids’ Indie Next Great Reads pick. ☙ THIS IS WHERE IT ENDS is a 2017 Top Ten Quick Pick for Reluctant Readers. ☙ THIS IS WHERE IT ENDS is a 2017 Teens’ Top Ten pick. ☙ THIS IS WHERE IT ENDS is a 2017 Teen Choice Book Awards finalist. ☙ THIS IS WHERE IT ENDS is a 2017 Colorado Blue Spruce Award nominee. ☙ THIS IS WHERE IT ENDS is a 2018 Buckeye Teen Book Award nominee. 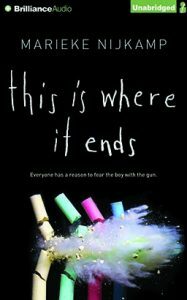 ☙ THIS IS WHERE IT ENDS is a 2017 ILA/CBC Young Adults’ Choice. 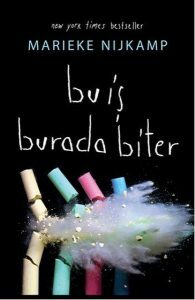 ☙ THIS IS WHERE IT ENDS is a 2017 Hebban Award for Best YA winner (Netherlands). 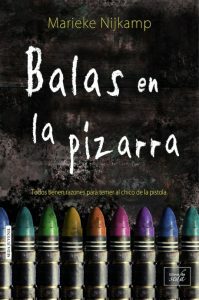 ☙ THIS IS WHERE IT ENDS is a 2018 Cultura Talents YA laureate (France). 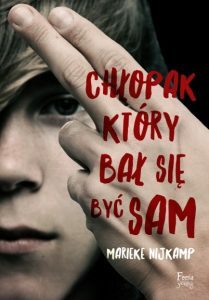 THIS IS WHERE IT ENDS is a 2018 Best Book Award finalist (Poland). 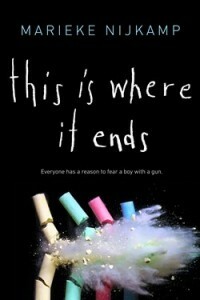 ☙ THIS IS WHERE IT ENDS is a Goodreads Choice Awards finalist (best YA fiction). ☙ THIS IS WHERE IT ENDS is a Cybil Awards finalist (best YA fiction). ☙ THIS IS WHERE IT ENDS is an Epic Reads Book Shimmy Award winner (category: Here and Now). ☙ THIS IS WHERE IT ENDS is a Barnes and Noble Teen Top Pick (January 2016). ☙ THIS IS WHERE IT ENDS is a Goodreads Best Book of the Month (January 2016). ☙ THIS IS WHERE IT ENDS is a Hudson Booksellers Best Book of 2016. ☙ THIS IS WHERE IT ENDS is a BuzzFeed Best YA of 2016. ☙ THIS IS WHERE IT ENDS is a Paste Magazine Best YA of 2016. ☙ THIS IS WHERE IT ENDS is a RTÉ Best YA of 2016. ☙ THIS IS WHERE IT ENDS is a 2016 ABC Best Books for Young Readers. If you want to discuss This Is Where It Ends with your class, teen group, or book club, a discussion guide is available.